I wasn’t able to attend the launch of Mega Creations Premium Sardines held at Manila Diamond Hotel last March because I was working. In this event, well-known chef Greg Villalon showed everyone how to spice up everyday meals using one secret ingredient: Mega Creations Premium Sardines. Chef Villalon prepared three homemade dishes made extra special using the Mega Creations Premium Sardines in Natural Oil and the spicier variant, Mega Creations Premium Sardines in Spanish Style. Below is Chef Villalon’s recipe for Moroccan Sardine and Sweet Potato Casserole. Now, Mega Creations Premium Sardines brings its delicious dishes to every home with Everyday Creations, an exciting new cooking show where foodies can learn how to whip up restaurant-worthy meals in minutes. Everyday Creations premiered last April 5 at 6:30 p.m. on The Lifestyle Network; it airs every Friday at 6:30 pm with replays on Sundays, 11:30am and Wednesdays at 6:00 pm. For more unique and easy-to-make recipes, visit the My Everyday Creations page on Facebook (http://www.facebook.com/MyEverydayCreations). 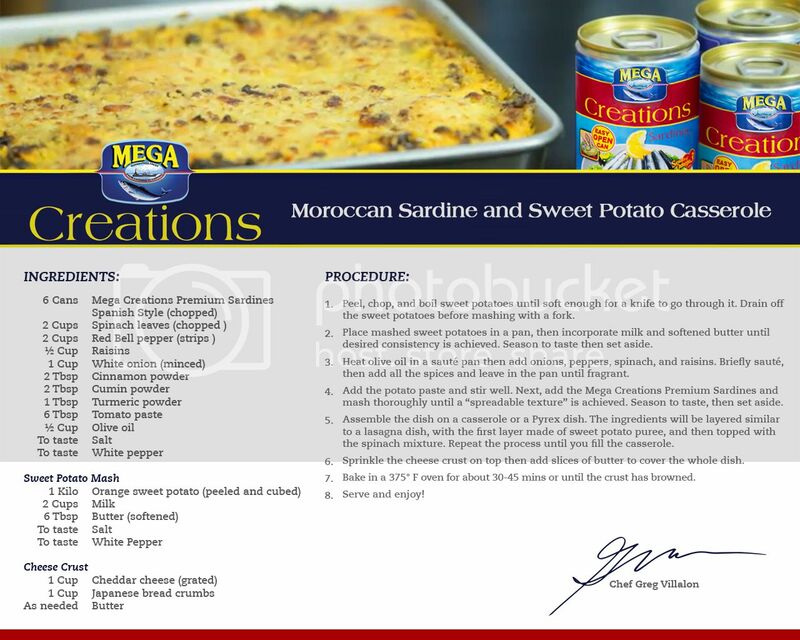 This entry was posted in Chef Greg Villalon, Mega Creations Premium Sardines, Moroccan Sardine and Sweet Potato Casserole. Bookmark the permalink.